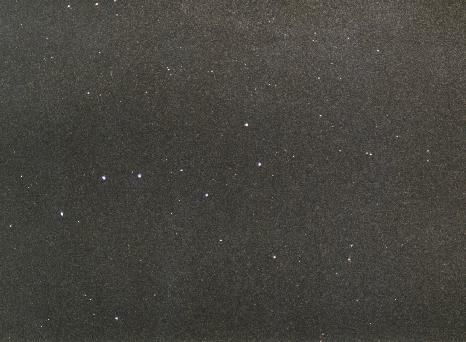 Kochab of Ursa Minor is the brighter of the two near the top edge to the left, while Cor Caroli in Canes Venatici is near the lower edge to the left. Between Kochab and the Dipper is Thuban in Draco. The hand and fingers of Bootes lie up and to the left of Alkaid, the brightest of which is Theta. At the right edge, below Theta, is Lambda Boo. Iota and Kappa Boo lie just to the right of Theta. Theta, Iota, and Kappa are oddly called Asellus Primus, Secundus, and Tertius, which refer to "donkeys.". See the two Dippers together with Draco. Ursa Major has three stars with orbiting planets: 47 UMa, Pi-2=4 UMa, and HR 4067. See Ursa Major from Bode's Uranographia of 1801.